Since then, China has upped the ante, in line with its declared “war on pollution.” In June 2014, a Chinese climate change expert told the press that the 13th Five Year Plan would include a total cap on carbon emissions – a first for China, and a welcome step in the global fight against climate change. In a joint announcement with the United States last November, China promised that its total emissions would peak by 2030 and that it would be drawing 20 percent of its total energy consumption from non-fossil fuels by 2025. Both those targets are likely to be ensconced in the 13th Five Year Plan. Meanwhile, a recent study by the London School of Economics paints an even rosier picture, saying that China’s emissions could peak as early as 2025. 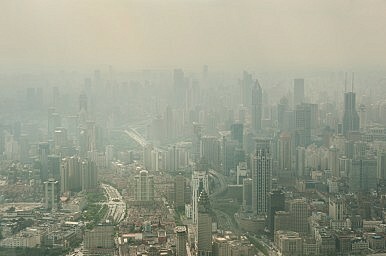 For the Chinese Communist Party’s purposes, however, emissions cuts are only part of the picture. Everyday Chinese are more concerned with troubling amounts of air, water, and soil pollution, the dark side of China’s grow-at-all-costs mentality over the past 30 years. Beijing is well aware of the issue, and has already made moves to try and change the calculus of local officials in favor of environmental protection. In December 2013, Xinhua announced that environmental measures would factor more heavily in performance evaluations for local officials. In April 2014, the government approved a revised version of China’s Environmental Protection Law, giving the Ministry of Environmental Protection more authority to punish polluting companies. China’s environment minister also pointed out that China’s old growth model must be discarded. “The Chinese environment is reaching or has reached its limit due to years of sprawling development at the price of environment,” Chen said, speaking at a meeting on the 13th Five Year Plan and the environment. He described China’s “poor” environment as a “bottleneck” that limits progress toward the key goal to creating a “comprehensively well-off society” by 2020. But Chen is optimistic that China is changing for the better. “The 13th five year plan period will be a crucial, strategically decisive stage where great things can be accomplished for China’s environmental protection,” Chen said. He sees synergy between environmental protection and the government’s push toward a “new normal” for the economy and rule of law for the country. That may be why Chen said he sees China’s environmental opportunities outnumbering challenges in the next five years. Chen’s right to point to the 13th Five Year Plan as a crucial period for winning the “war on pollution.” The details are still being hammered out, but an ambitious plan that calls for more efficient energy use and reduced pollution is within reach. Is China’s Environmental Tide Turning? 4 Things to WatchWhat Does the NPC Have to Say About China's Pollution Woes?Can a Documentary Change the Course of China's 'War on Pollution'?Does China Still Want to Be a Global Environmental Leader?Can Chinese Cities Leave the Car Behind?